If you love fudge as much as I do, you need a few microwave fudge recipes that you can whip up quickly in case of emergencies. You know what I mean by emergency, don't you? You are having a sweet tooth attack and are just dying for some rich creamy chocolate fudge. Try these! In a 4 quart microwave safe bowl heat the margarine on high for 1 minute or until melted. Add sugar and evaporated milk; mix well. Microwave on high for 11 minutes, stirring every three minutes and scraping the bowl well. Add the chocolate chips and stir until melted. Add the remaining ingredients and mix well. Pour into lightly greased baking pan. Cool at room temperature. Cut into squares. Coat a 9 inch square pan with cooking spray. Line the bottom of the pan with wax paper and spray again. Set pan aside. Combine 1 package of powdered sugar, peanut butter, and 1/4 cup plus 2 T. of milk in a large microwave safe bowl. Stir well. Stir in 1/2 teaspoon vanilla. Cover with wax paper and microwave on high for 2-3 minutes. Spoon into pan. Place butter in microwave safe bowl. Microwave on high for 1 minute or until melted. Stir in 1 package powdered sugar, 1/4 cup milk, and cocoa. Cover with wax paper and microwave on high for 2-3 minutes. Stir in 1 tsp. vanilla and peanuts (optional). Spoon mixture over peanut butter layer and let set. Cut into squares and store in airtight container. Combine powdered sugar, cocoa, milk, and butter. Microwave on high power until butter is melted, about 2 to 3 minutes. Stir until smooth. Blend in vanilla and pecans. Spread into a buttered 8-inch square pan. layer; cool and cut into squares. These microwave fudge recipes are just a few of my favorites. They are so simple to prepare, but still have that delicious taste that everyone loves. If you've got one of your own microwave fudge recipes that you would like to pass on, please do add it here using the form below. 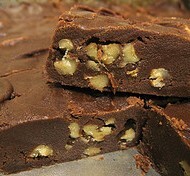 What Is Your All Time Favorite Fudge? Seriously, though, let's see who comes up with the best fudge creation of all time. Submit yours and we can all judge and comment for ourselves.